TULSA, Okla. – Major League Fishing pro Brandon Palaniuk is fresh off of a ninth-place finish in Stage Four of the Bass Pro Tour. Throughout his time on Lake Chickamauga, Palaniuk had success using topwater baits that helped him boat more than 180 pounds of bass over four days of fishing. I spoke with the Idaho pro to get some tips on how to get the most out of your topwater bait in early spring. Palaniuk spent most of his week throwing a Storm Arashi Cover Pop in a Bluegill pattern. He said he chose that color because Chickamauga’s largemouth were in a late pre-spawn and early-spawn stage. Palaniuk said that a lot of anglers try to work their topwater bait too quickly, and that can end up hurting you more than helping you. While you may be focused on what type of topwater bait to use, Palaniuk explained that using the right rod is a large part of the equation as well. Matching up your bait with the correct tackle can take you from a few nibbles to multiple big bites. However, when choosing your rod, do your research. There are a couple of different variables that Palaniuk says can make or break your cast and retrieve. Palaniuk and the rest of the Bass Pro Tour field return to action on April 30 for Stage Five from Cullman, Alabama. Crankbaits are one of the best ways to catch bass in the springtime. Shallow-running and mid-depth crankbaits come in all shapes and sizes and are a favorite for anglers of all skill levels. While these lures will absolutely catch fish right out of the package, there are a few simple changes you can make to maximize the effectiveness of your favorite plug. My day job takes me all over the country following professional fishing tournaments and as an avid angler myself, it has afforded me the opportunity to learn a lot from the pros. These three easy modifications are steps I’ve noticed pros regularly make when relying on a crankbait to bring home the bacon. Changing hooks on a crankbait is a well-documented modification, and for good reason. Spend time in the boat with any cranking aficionado and you are bound to see them swap out their treble hooks a time or two. The process takes no more than 30 seconds with a little practice, or if you have a good pair of split-ring pliers. Kevin VanDam is one such crankbait connoisseur and has arguably won more money winding a plug than any other person on the planet. VanDam is unapologetically meticulous about changing his hooks out with Mustad KVD Elite Series Triple Grip Treble Hooks. I spoke to VanDam after his 2018 Bassmaster Elite Series win on Grand Lake where he used a Strike King 1.5 Squarebill Crankbait to catch most of the bass he weighed in. VanDam said he went through 100+ treble hooks throughout the four-day event. Freshening up his hooks each night along with numerous times on the water after grinding his plugs over rocks, wood, and catching lots of bass. KVD fishes at the highest level and is on the extreme end of the spectrum, but taking the time to change hooks even once or twice a day makes a big difference. There are a several reasons and benefits received by changing treble hooks, but the primary advantage lies in ensuring the hooks remain as sharp and sticky as possible. Bass are notorious for slapping at crankbaits as often times it’s a reaction strike causing them to bite. Regularly swapping out treble hooks helps you hook up with those kinds of bites, ultimately resulting in landing a few more fish throughout the day. If you are out fishing for fun, this might mean one or two more bass during your day off, but if you are fishing competitively this 30-second modification could save a lot of money. Another quick and easy crankbait modification that’s not-so-talked-about is using a snap swivel as a line tie on your favorite plug. The last few years I’ve noticed many seasoned crankbait anglers employ these snaps when fishing shallow running crankbaits in the springtime without thinking much of it. It wasn’t until walking the boatyard at the 2019 Bassmaster Classic a month ago that I took notice. The 2019 Classic was held on the Tennessee River and most suspected a crankbait would play a big role for those who finished near the top of the leaderboard. Almost every competitor had two or more plugs on the deck of their boat. And, most of them were attached to a swivel like a VMC Duolock Snap. I’m not the smartest dude in the world, but seeing this made a light bulb go off. Throughout the late winter and spring, a snap swivel helps give a plug a more erratic action as it’s slowly crawled over rocks or wood. You don’t necessarily want an aggressive action this time of year, but having your crankbait dart erratically after popping it loose from cover or during pauses on a retrieve can trigger sluggish bass into biting. Other added benefits of these swivels include protecting your knot and line from abrasions as your crankbait bill digs across the bottom, along with making it much quicker and easier to swap out to a different lure. It’s worth noting that most anglers retire their snaps when water temperatures warm, as snap swivels can be a hassle when fishing around vegetation or through heavy cover. But for cold-water or springtime cranking, adding a snap swivel to your repertoire is worthwhile. Custom paint jobs are a third modification many experienced crankbait fisherman practice. Custom colors can have a notable impact depending upon which fishery or region of the country you are fishing. It’s not that there aren’t excellent color choices available right out of the package-there certainly are-and lots of bass are caught on them. But when faced with relatively clear water clarity, pressured fish or unusual forage, having custom color schemes to show bass something different can prompt bites you may have missed. Often times professional anglers keep these custom painted lures extremely close to their chest, as they know a “secret color” gives them an advantage. There are countless individuals and companies who carry out these custom paint jobs. A quick Google search will uncover a myriad of different people you can contact if you are interested, but I’d suggest looking for a painter in the same area of the country you fish. Colors become regional staples for a whole host of reasons, and taping into this local knowledge will shorten the learning curve. Typically this service costs anywhere from $10 to $50 per lure, so it can get costly in a hurry. Fortunately, paying $20+ or more for a custom paint job isn’t the only way to set your crankbaits apart. Ott DeFoe won the 2019 Bassmaster Classic and did most of his damage with a lipless crankbait he marked up with a Sharpie! All you need is a little creativity and a can-do attitude to customize the color of your plugs. Like DeFoe, you can use permanent markers or nail polish to add colors to hard baits, while fine sandpaper or “sun baking” a plug on a truck dash is another terrific way to change the look of a lure. Sometimes a crankbait’s color is a little too bright or loud for bass in certain scenarios, and these processes help to dull some of that brightness. If you plan on slinging a crankbait around this spring, give these simple modifications a shot. Each one has its own unique purpose and will cause your crankbaits to get bites other anglers might be miss, along with helping you land more bass. On the SEARCH for Pre-Spawn GIANTS – River Bass Fishing! Bass spawn every spring and knowing where to find fish during this time is key. One good place to locate spawning bass is near fishing docks. Many bass seek shelter in flooded timber or next to laydowns or big rocks, but on my home waters of Lake of the Ozarks numerous bass build their nests behind boat docks. The docks offer plenty of protection for bass from wind and intruders because the nesting fish can seek shelter behind cables, next to pillars, under walkways and in sunken brush piles. The thousands of docks on my lake gives spawning bass plenty of options but choosing which docks to target during the spawn could be like trying to find a needle in a haystack for a novice angler. Finding the right dock and then recognizing a pattern is essential in staying consistent. 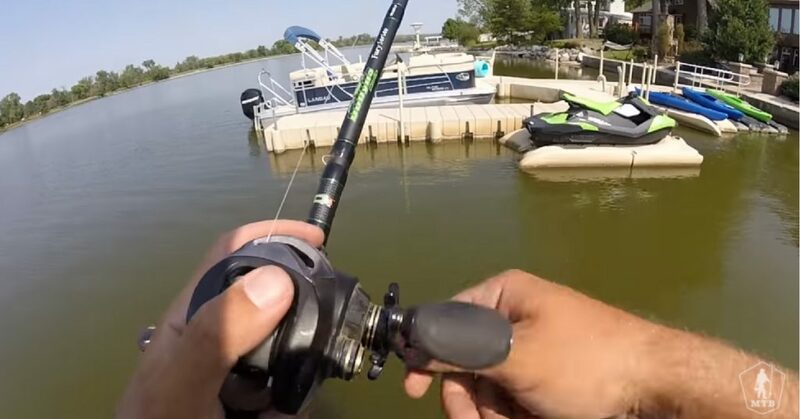 The best way to find docks harboring spawning bass is keying on location. I have found most of the spawning bass on my lake prefer building nest behind docks in the backs of coves or in pea gravel pockets. Some spotted bass will build their nests behind large community docks on the main lake or docks situated in the small pockets of bluffs. The most dilapidated dock you can find in a cove usually attracts spawning bass. There are usually broken pieces of the walkway or other debris from the dock hanging down in the water that bass use as shelter for their nests. Docks with pillars are prime spawning spots for bass because the fish will build nests next to the supports. Bass seek shelter during the spawn, hard to reach areas are known for holding fish. Floating docks held in place by a series of cables are dominant on my home lake. Any docks with two or three sets of cables extending from the pier to the bank are prime nesting spots for bass. 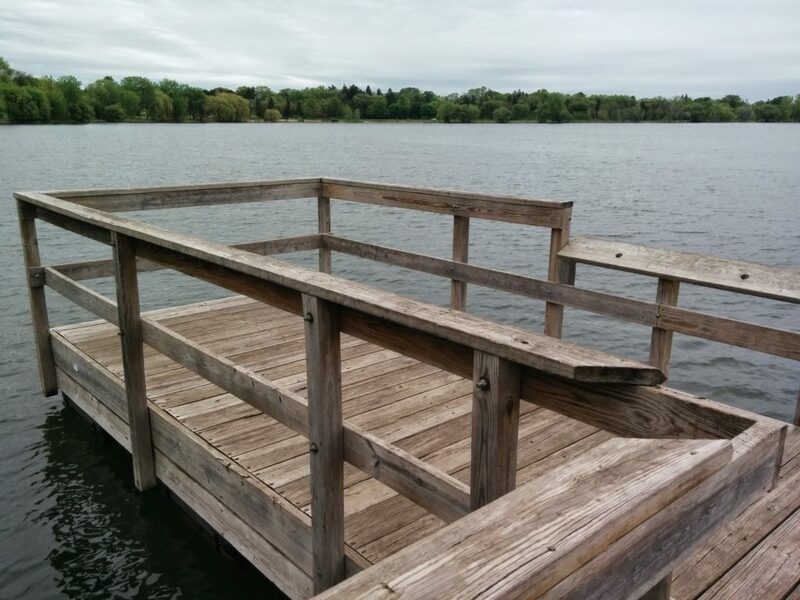 If a dock has multiple cables making it difficult to cast behind it, bass will flock to this floating structure for security. I have seen some bass build their nest right under the cables because they seem to know most anglers won’t throw into the metal cables. I have also seen bass fry hang under cables after the spawn so I wonder if it is ingrained into a bass’ brain that dock cables are their security blanket. When checking a row of docks for spawning fish, it’s best to skip any docks where you don’t see around, shiny spot on the bottom, which is the telltale sign of a bass nest. Usually, the biggest bass are on the nest you can barely see in deeper water. Bass spawn at various depths so start off fishing deep and work you way shallow. Bass often build multiple nests behind bigger docks, so make sure you fish the deepest area behind the dock first rather than any nest you can see close to the bank. If you fish the visible shallow beds first, you will probably have your boat almost sitting over a big bass on a nest in deeper water. That fish will probably spook off its nest and you missed out on the chance to catch the biggest bass behind the dock. 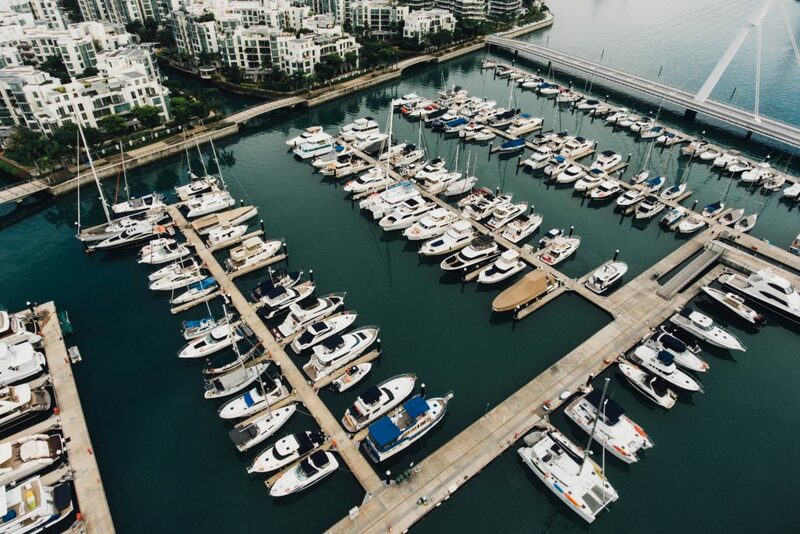 The height of the cables determines where you should position your boat to catch nesting fish behind a dock. If the cables droop down into the water, you can move your boat up next to the moorings and flip your lure to the rear of the dock. 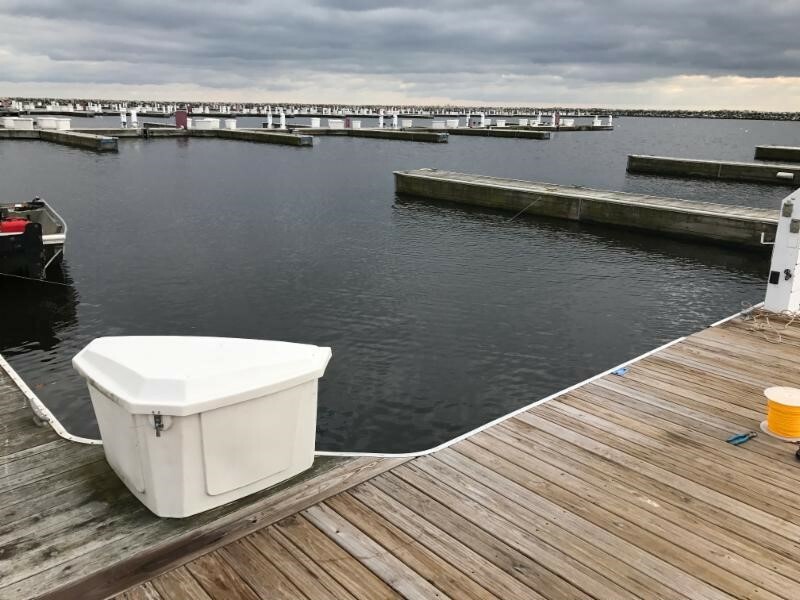 If the cables hang above the water’s surface, you should keep your boat 5 feet or more away from the cables so you can skip your lure under the dock supports. Using a Casting vs Spinning rod can depend on water clarity, nearby cover, and the mood of the fish. Even though you will be fishing around menacing metal and wood objects that can easily cut your line, you can use either heavy baitcast tackle or lightweight spinning gear to catch spawning bass behind docks. When fishing murky water I use line as heavy as 25-pound test fluorocarbon, but in the clearest sections of my lake I drop drown to 12-pound test for my baitcasting tackle and 8-or 10-pound line for my spinning gear. Once I find some nesting bass behind docks, I have about five or six rods with various lures attached on the deck of my boat for tempting the fish. I either pitch over the cables to the nests or skip my lures beneath the overhanging cables and walkways. 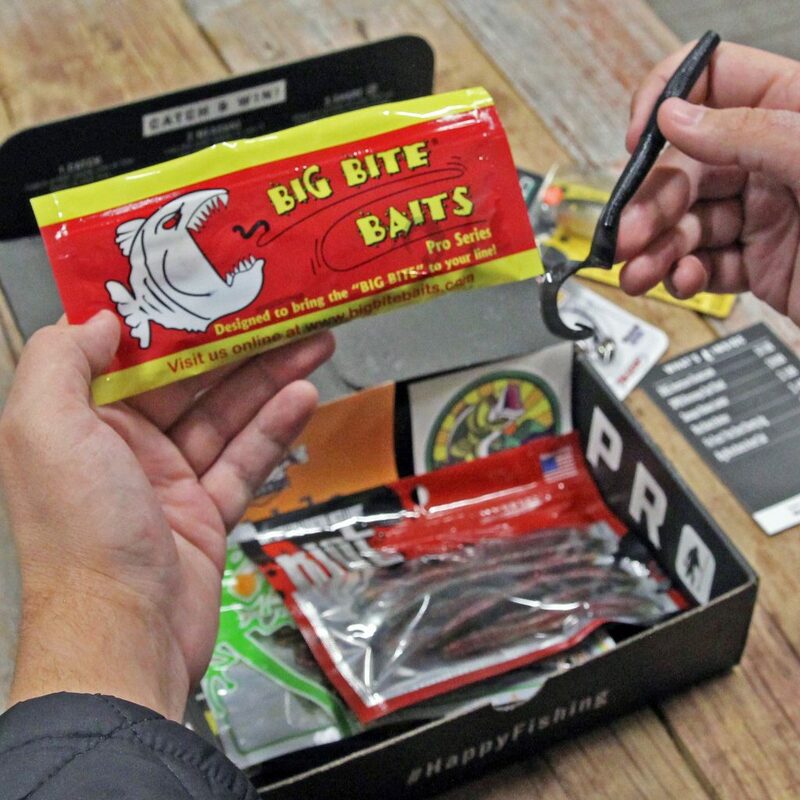 A Mystery Tackle Box subscription will help prep you for the spawn. Some of my favorite lures to pitch on baitcasting tackle are jigs with plastic craw trailers, Zara Spooks, double-tail plastic grubs, shaky head plastic worms and Texas-rigged plastic creature baits or plastic lizards. My lure choices for skipping behind docks with spinning gear include soft plastic jerkbaits, tube baits and wacky-rigged Senkos and floating worms. The real challenge for catching spawning bass behind a dock occurs when the fish bites and you set the hook. Trying to coax a stubborn bass through pillars and around cables can be a hair-raising ordeal. However, with your drag set right so the bass can make some short runs without breaking your line and some patience you can eventually wear down the fish and lead it to the boat.